Leonard Cohen is an interesting character in that his music has taken many different paths over the years. Before this release he was a noted poet and had published two novels. With this debut album we see him making the leap from poet to musician with great success. Musically it is very much steeped in English Folk tradition however Cohen was part of a new movement of musicians who played folk music but didn’t have ties to the politics and such of the folk movement. This album is quite dark and as a result never really had great commercial or critical success. It did however foreshadow the career of a great musician who went on to become a musician’s musician. Cohen seems to have had far more success amongst his musical peers than he ever did commercially. The thing with Leonard Cohen is that he started out as a poet who decided to put those words to music and he did so in his mid-30s, so the music he makes comes from a different place to most. On this album musically it is really sparse and simple, so you are almost forced to listen to the lyrics. To me the music is a soundtrack to the stories he is telling, and in that regard the sparseness does exactly what it is intends to do. I’ve been a long time fan of Cohen and as a lover of poetry I enjoy nothing more than putting on one of his albums and letting myself be taken away with the narrative of each song. Because of this my favourite songs on “Song of Leonard Cohen” are the one that most evoke a sense of whimsy and tell a tale of love. ‘Suzanne’ is to this day one of my all time favourite songs. There is no song on the album I dislike and I’m hard pressed trying to pick out just my favourites, so we’ll just leave it at ‘Suzanne’. There is a certain melancholy that runs through Cohen’s work, but there is also a sense that he knows he is sometimes overly serious and isn’t afraid to poke fun at himself. This is most notable later on in his career but can be seen here on ‘One Of Us Cannot Be Wrong, “I lit a thin green candle to make you jealous of me / But the room just filled up with mosquitoes / They heard that my body was free”. Using music to support the words is something that Cohen continues to do throughout his career. With the progression of each album he has learned to manipulate the music even more but the three things first displayed on this album always remain: the lyrics, the simplicity and the beautiful backing vocals of many beautiful women. Because I was so familiar with this album, I alternated listens between “Songs of Leonard Cohen” and his latest album “Old Ideas”, released earlier this year. There are 45 years between the two albums. The thing I love about them both is that they are timeless. And that’s what Leonard Cohen does. He doesn’t write music to fit an era or place. He writes music like it’s the only thing he knows how to do in order free the demons, and as a result it’s an extension of him. He writes very personally so you connect personally, meaning you will either love it or hate it. 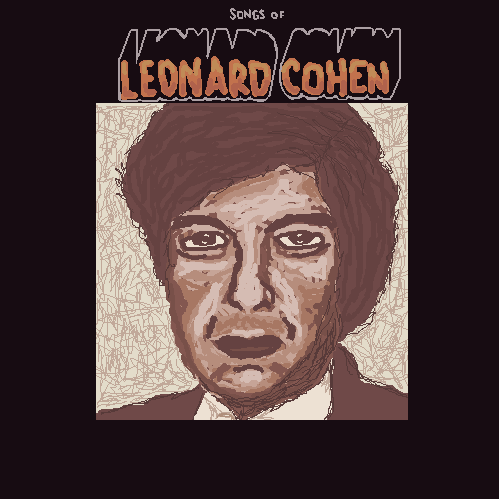 Cohen’s praises have been sung by many a musician, and if you look at who these musicians are you will see they also fit the ‘tortured artist’ archetype – Antony Hegrty, Nick Cave, Rufus Wainwright, Lou Reed, and the list goes on. These too are artists that people either love or hate, so he is in good company. I adored revisiting this album all week. It was like hanging out with an old friend. The kind that knows all of your history and stories and still loves you anyway. Someone you can just totally be yourself with. And that’s how I feel about Leonard Cohen. No matter what may be going on in my life there is always a Cohen album there to comfort me. When I first listened to Leonard Cohen’s debut album “Songs of Leonard Cohen”, I was a little underwhelmed because I had very high expectations. Everyone knows that Cohen has the legacy of being one of the greatest lyricists and song writers of the 20th and 21st Centuries. I think I was expecting it to be a bit more sparse than it was, maybe a little prettier, a bit quieter. Which was interesting because along the way I learnt that Cohen apparently wanted the album to have a more pared-back feel, but the producer insisted on adding further instrumentation and embellishment to the tracks. Luckily Cohen got his wish with his second album, pulling the production right back. My favourite track was ‘So Long, Marianne’; I listened to that track many times and know that I will for a long time. It made me think of some of the songs of one of my top 5’s, Ray Lamontagne. ‘Marianne’ was closely followed by album opener, ‘Suzanne’. It intrigues me that so many musicians, especially in the 60’s and 70’s had a thing for some bird named Suzanne (James Taylor especially), she must have been quite a catch!! Overall I would say that I liked the album, but I wouldn’t be rushing back to it anytime soon. Some of it was really beautiful but some of it got boring and dragged on a bit. At times, it was like listening to Johnny Cash combined with Bob Dylan – not for me, I’m afraid! Negativities aside, the more I listened to it, the more I enjoyed it. I plan to listen to more Leonard Cohen, especially because the future work was apparently pared back. After all, it would be foolish to pretend that he hasn’t influenced hundreds of other musicians, and not to explore why. along to ‘Hey, That’s No Way to Say Goodbye’. That was about as good as it got for me though; Cohen didn’t touch my perfect body with his mind. I’m thankful to producer John Simon for insisting on more instrumentation than just Cohen and his guitar, but I do not hear the greatness that so many fans and critics seem to. I do, however, now have a new appreciation for this scene from The Young Ones. I didn’t risk spinning this album while driving, because that’s a bad place to fall asleep. Although not without its charm, this album is the musical equivalent of Valium. Do not listen to before operating heavy machinery.